House (120 m2 + 1.000 m2 for plot) located in Lloret de Mar, 7 km from the beach and from the centre of Lloret, in the quiet residential area of Lloret Blau. Simple house with 2 double bedrooms (2 double beds) + 1 tripple bedroom (with bunk-beds), a living-room (TV), a kitchen (microwave), washing machine, 2 bathrooms. Private pool (9 x 4 m) and garden. Terraces. Parking (2 cars). Barbecue. Views of the sea and the mountain. Optional heating. (not included. Extra price for using it: 50 euro/week). Simple house in La Creu de Lloret, a quiet area of Lloret de Mar. The main house consists of living room (TV, fireplace), fully equipeped kitchen open to the living room (hob, oven, dishwasher, microwave) 1 single room, 2 double bedrooms (1 double bed, 2 single beds) and 1 double bedroom en suite (with bath) plus a bathroom with tub. It also has an apartment next to the house with separate entrance, consisting of living room, double room (double bed) and bathroom with shower en suite. In the outdoor area we are a nice summer dining area, plus a private pool (8x4) and a barbecue. Mountain views. Simple house on the Creu de Lloret, a quiet area of Lloret de Mar. The house has a small apartment with double room (double bed) and bathroom (bath) right next to the main house with separate entrance. In the main house there are 3 double bedrooms (1 double bed; 4 single beds), bathroom with bath, living room (TV, satellite, fireplace), separated and equipped kitchen (microwave, oven). In the outdoor area is a large terrace with barbecue area, plus a private pool (7x3.5) in the form of heart, at the entrance. Villa with private pool and garden of 150 m2 located in Esclanyà, 3 km from the city center and 6 km from the beach in a quiet area. It has 3 double bedrooms (1 with double bed of 135x190cm and the other 2 with 2 beds of 90x190cm in each), living room (TV, fireplace) with access to a terrace and garden, kitchen (gas stove, oven, microwave, dishwasher) with exit to a terrace, 1 bathroom with bath and another outside the house with shower and washing machine. Pool of 8.2 x 3.6m fully fenced (65m2). Parking. 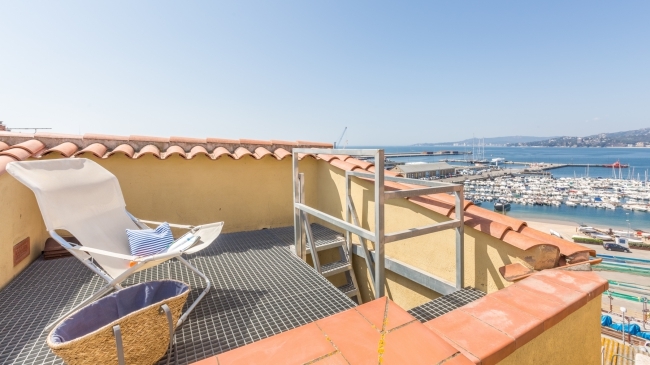 Beautiful renovated duplex apartment of 95 m2 located in the center of Palamós, in the ancient district, just 100 meters from the beach and the port. On the 2nd floor without elevator. It has 3 bedrooms (1 suite with double bed of 135x185cm and shower, 1 bedroom with double bed of 140x185cm, 1 bedroom with trundle bed 90x180cm), a complete kitchen (Vitroceramic , microwave, oven, washing machine, dishwasher), 1 further bathroom with shower, living room with TV and air conditioning. It has two terraces (one indoor and one outdoor), also has a small terrace overlooking the sea (access with stairs). Air conditioning in all rooms (Not included: 100 euros / week). Pets not allowed. Villa Vila is a house of 170 m2 + 800 m2 of land, located in a quiet residential area of Lloret de Mar (Serra Brava), just 3.5 km from the beach. The house is spread over 2 floors, each with a living-dining room, a kitchen and 3 bedrooms. The main floor has a living-dining room (TV, fireplace), a fully equipped kitchen (dishwasher, microwave, gas stove, washing machine), 2 bedrooms with double bed (135 x 185cm) and 1 single room (bed 80 x 190cm). Bathroom with bathtub. The upper floor is identical, except for the rooms; 1 double bedroom (130x190cm) and 2 triple bedrooms (bunk beds + a single bed in one of the bedrooms, bunk beds with trundle bed in another one (80x190cm; (90x190cm); 4 x (80x180cm)). 2 beautiful terraces, a large outdoor area, a 9.5x4.5 pool, barbecue and swings for children, sea and mountain views, optional heating (not included: 50 € / week). The photos of the beach do not match the view of the house. This is Cala Canyelles, the closest beach to the villa. It is a beautiful beach of 500 meters thick white sand, characteristic of the region. Possibility to rent umbrellas and deck chairs, activities such as pedal boating, canoeing and water skiing and parasailing. You can also enjoy Mediterranean cuisine, including fish and paella, in the restaurant located on the beach.